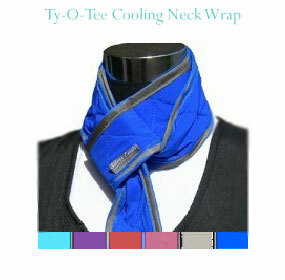 Made with our unique three-layer cooling fabric, the Ty-O-Te cooling neck wrap is a convenient solution to hot temps in any situation. Machine washable and lightweight, the neck cooler can be looped around for stable placement where you want it to cool you most. Made with our unique three-layer cooling fabric, the Ty-O-Te cooling neck wrap is a convenient solution to hot temps in any situation..
Headwear: Silver Eagle Ty-O-Te's are activated by soaking them in tap water. For maximum cooling time, allow them to absorb water into the fabric's core for 3 to 5 minutes. Wring out excessive moisture and towel-dry the inner surface if desired. For shorter periods of cooling, turn the gear over and pour a limited amount of water into the liner, allowing it to fully soak into the fabric's core. Be the first to review the Ty-O-Te.